After implementing Engie Ineo's operational support and rider information system last year, the STO can now move on to the next phase by making the real-time data for the bus stop times available for its clientele. Thanks to a partnership agreement with the Transit app developers, the STO was able to validate its new data so that riders can now use their cell phones to check stop times that have been adjusted based on a bus's GPS location. “The availability of real stop times in the Transit app is excellent news for the STO's clientele. It will now be easier to plan trips, because riders will know when the bus is arriving at their stop, even in bad weather or if there are delays in the system,” stated STO Chairwoman Myriam Nadeau. “By working with a globally recognized app that prioritizes public transit, the STO is clearly directing riders to where they can easily find information,” added Sam Vermette, Chief Executive Officer of Transit. “We are proud to work with Transit, a Quebec-based company, and are eager to see more riders include real time in their routine in order to improve their rider experience on the buses,” stated STO General Manager Marc Rousseau. In collaborating with the Transit app developers, the STO is taking the first step towards real-time open data sharing. The data will soon be made available to other app developers. Riders have more travel options because they can choose their bus based on the real time that the buses on different routes will be passing a stop. 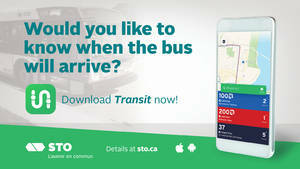 Transit is available for iPhone and Android, and can be downloaded at www.transitapp.com or www.sto.ca.